'I first came to Brooke 5 months before I stepped on stage and competed in my first competition, and I will never be the same for it. She is amazing! When I gave myself the challenge to step out of my comfort zone, I knew I needed someone to lead the way who wanted the best for me and was realistic about my goals. Someone who understood shiftwork, someone who would show me the healthy way to achieve my goals and someone I felt comfortable enough to be honest and open with. That’s when I decided to contact Brooke. She has been there right from the start and never stopped believing in me. She made it so easy to follow a meal plan that would work with my lifestyle and that was full of yummy foods. "I decided to join BFN because I needed further training, nutritional guidance, and a program that would challenge me. 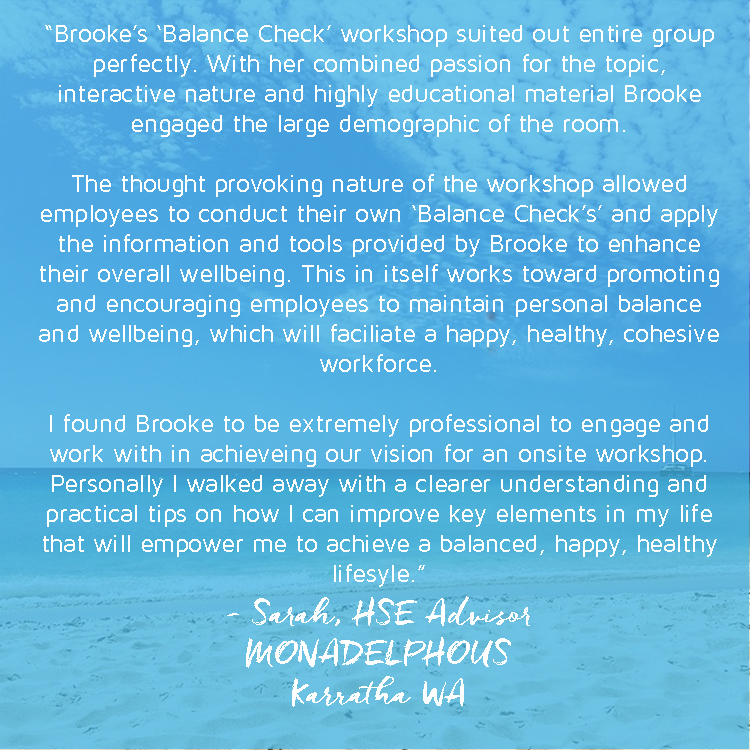 I signed up with Brooke as I believe in the BFN values in striving for balance when trying to live an active, healthy lifestyle. I wanted to find that balance. I was motivated by my 30th birthday trip to the America but mostly because I was looking for a healthy lifestyle change in order to become leaner, stronger and fitter version of myself. I lost 5kg and one dress size well before the end of the program and with such great results, continued on as a BFN client. 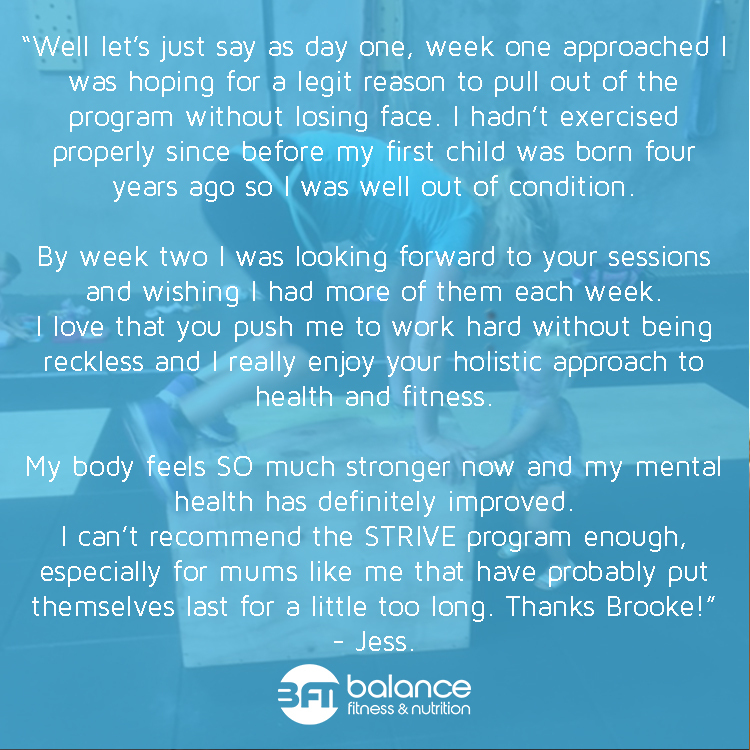 What I loved most about the program was that it was simple to follow and realistic - I could incorporate the plan into my everyday life, especially for a stay at home mum of two children. I really enjoyed the food, constant support and coaching I received from Brooke to help me remain positive and achieve my desired results. Doing this program has given me not only great results but has made me realise that the sky is the limit. I am more confident in the gym, my fitness levels have improved, and I am getting stronger every week. I have continued to achieve things I never thought I could of which means my mental fitness has improved giving me the ability to push myself further. It feels pretty amazing! "After having two kids I did not think that I could ever bare that much flesh in public. Brooke has always been a role model of mine and she is what I perceive to be the perfect representative of health and fitness. I never imagined that there would be a program that would be balanced enough to allow me to have it all; having two kids & working. One of the best things about BFN was the variety in the programs. It was very life friendly and adaptable. My exercise programs were extremely varied and I never found that I was getting bored following any of the workout programs. I pushed my body to the limit and I had an amazing coach to help me get there. There were days when I thought I couldn't keep going and Brooke would be there telling me to "trust the process". There are literally hundreds of instructors, life coaches, personal trainers, cowboys of nutrition and online plans out there but in my opinion the most important thing in a coach or trainer is knowledge. Knowledge is so important after all the human body is all about science and scientist are discovering new things about the human body all the time. If you choose the wrong coach you could end up with outdated information, training harder for less results or worse injured. I felt I was in very good hands as Brooke has the backing of not only one, but two university degrees in sports, exercise and nutrition. "I've loved having Brooke's fitness & nutrition plans keeping me on track and achieving my goals. Initially I was after some help to lose a few kilos and improve my overall fitness. Brooke listened to my goals, was interested in me as a person and completely engaged herself. Within the first six weeks I lost 5.1kg and 22cm throughout my waist and hips. Amazingly, my nutrition plan never left me hungry. I did struggle with my sweet tooth at times and when I discussed this with Brooke she switched up my plan and included some treats for me that still saw me achieving my goals. Whilst my fitness plan could at times be challenging it got me fitter than I ever have been. I learnt my way around the weights room, which gave me the confidence to nail my workout no matter who was on the next bench to me. I am stronger now than I thought I could ever be. And my goal of running 6km in 45 minutes was smashed when I ran 8km in 47 minutes in the MDC.